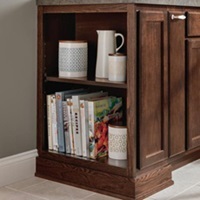 As you begin to look at different cabinetry solutions, you'll notice they are usually classified into categories such as base cabinets, wall cabinets and tall cabinets. In this overview, you'll learn all about base cabinets and the kinds of cabinet storage you can create with them. So when it's time to choose cabinets for your home, you can talk like a pro. 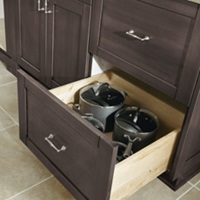 As the "heavy lifters" of cabinetry, kitchen and bath base cabinets provide bulk storage space. They often have shelving inside for items such as pots and pans, cookware or cleaning supplies, may have pull out racks or roll trays for easy access to items, or include features such as recycling bins, wastebaskets and laundry hampers. When a Toekick drawer is added to the bottom for additional storage, a base cabinet sits on the floor. 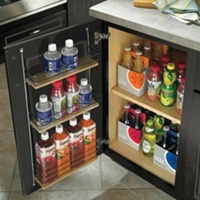 Wall-hung base cabinets are also available without a Toekick drawer. 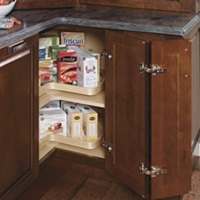 Base Easy-Access Cabinets are built with a middle shelf, plus small racks attached to the inside door for greater accessibility to often used items. 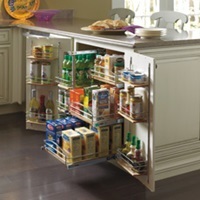 Base Pull Out Cabinets keep often-used items close at-hand on small, open shelves fitted with racks to keep items from tipping over as the shelf is pulled out. Corner cabinet storage can include a built-in Lazy Susan cabinet to help make the most of kitchen space that is otherwise difficult to use. SuperCabinets are the overachievers of the base cabinet category. 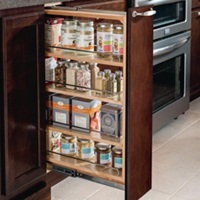 Available in numerous varieties, they are equipped with adjustable pull out shelves, pull out wire racks and generous door storage in racks attached to the inside of the cabinet doors. Two Drawer Base Cabinets make it easy to find what you're looking for without having to dig deep into shelving to find what you need.